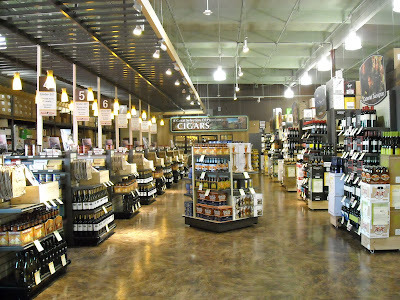 I recently had the opportunity to stop by a brand new location of the wine super store "Total Wine & More". For those of you who have had these amazing stores sweep into your city or town you can probably testify to the fact that it completely changes the "wine retail game". These store have like over 10,000 different wine and liquor labels and that number is being conservative. I didn't ask the clerks how many wines were available but I wouldn't be surprised it the number was actually closer to twenty thousand. Anyways, when I entered into this wine and liquor wonderland I was instantly transformed into a proverbial mind-boggle and with wide eyes continued down the first row of the store. "Geeeeszz".... I thought to my self, "How on earth is there that many grapes vines grown in the world to make all of this??" Now, I consider myself to be a real wine guy and have been lucky to taste a few thousand wines during my wine enthusiast career.... but you know what? I don't think I had ever seen even half the labels they had available in my life. I do know that they specialize in private label so it's no surprise I didn't recognize a fair share of the wines. As I walked through the store for about thirty minutes I noticed that I had not been approached even once by an employee for advice. Now, being the type of wine snob that I am I would have probably told a wine steward to bug off, but still it would have been nice to see them actually care. Now to be fair to Total Wine, this has happened to me dozens of times at Bevmo and I actually care for them even less! The feeling you get when you go into these stores is cold and sterile and for this reason I think the mom and pop wine shops have a chance. Sure, they can never compete in terms of pricing but if a consumer who really wants to be educated comes in then the lowly wine geek steward is worth the price of admission! There's something to be said for real customer service and knowledgeable, caring, professionals. Those independent wine shop owners who really take the time to know their customers and treat them with care and loyalty will not only survive in this economy but I believe they will thrive. I have to agree, it is much more enjoyable to shop at the Mom & Pop stores. I have about six that I frequent and the relationship that developed over the years cannot be matched at the huge chains.